Collaborated with copy and programming teams on daily deals and marketing initiatives. Art directed, trained and managed freelance designers, copywriters and creative interns. Art directed photo shoots for special promotions. 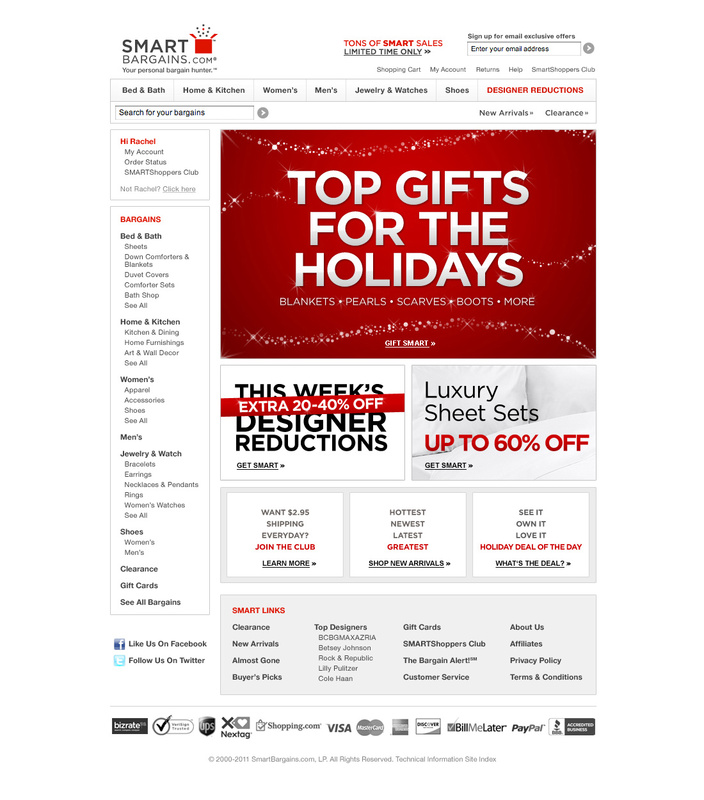 Initiated, designed and executed a site refresh of SmartBargains.com. Outside of featured promotions, the site design had not been updated in over 7 years. Extra styling like duplicate, secondary menu items with bullets, bold fonts and underlines distracted from the shopping experience. Refined the design and optimized the user experience through updating the navigation and removing unnecessary pages. Redesigned gift card and subscription-based shopping club landing pages which were also promoted on Facebook through integrated tabs. 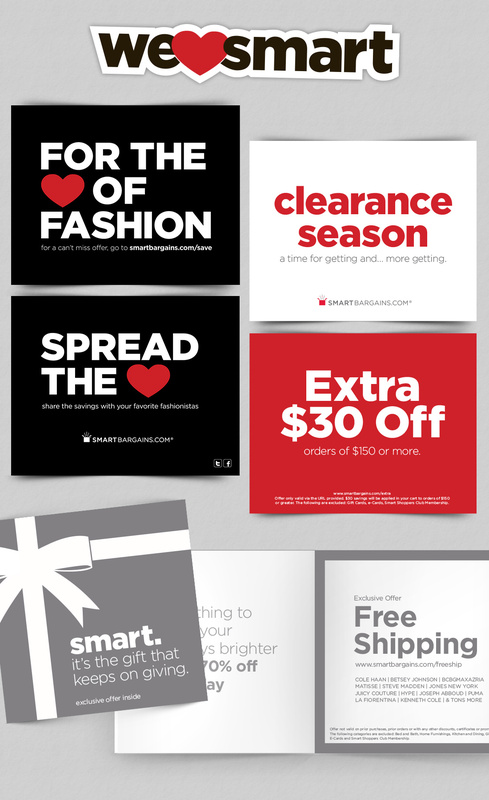 As part of the Smart Bargains brand refresh, I partnered with our copywriter to conceptualize a campaign to promote the brand and reinvigorate the staff and long-standing customer base. 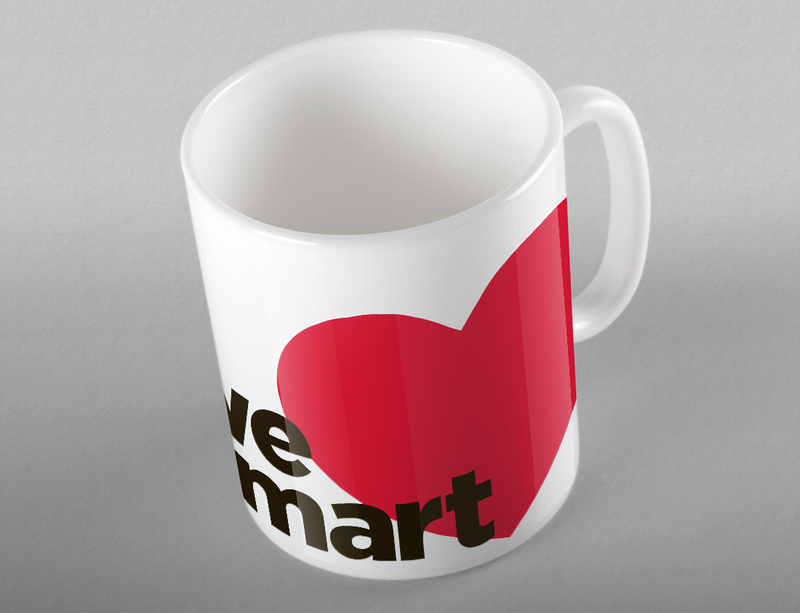 Together we came up with “We Heart Smart” which encapsulates all the things to “<3″ about Smart Bargains. The digital side of the campaign featured email marketing blasts, company-wide emails, office-wide takeovers, Facebook Fan-gates, tabs and profile images, we even created a We Heart Smart Tumblr page. Increased Facebook and Twitter fan base by 450%, as well as page views and engagement. Featured on The Retail Email Blog twice, including their Design Hall of Fame post. As part of the Smart Bargains brand refresh, I partnered with our copywriter to come up with a campaign to promote the brand and reinvigorate the staff and long-standing customer base. Together we developed the “We Heart Smart” campaign which encapsulates all the things to “<3″ about Smart Bargains. The print side of the campaign was featured in 2 seasonal mailers that went out to our entire customer base, package inserts and Valentine’s Day cards. I also designed coffee mugs and stirrers that were distributed to every employee and placed throughout the Boston and New York offices.